Southfield, Mich., April 4, 2017...Blake Brown, an open-wheel dirt modified racer who resides in Corbin, Ky., and Der ek Fetter, an automotive enthusiast and collision repair technician from Troy, Mo., are the grand-prize winners in the 2017 "Search for a Champion" contest from Federal-Mogul Motorparts' iconic Champion® brand. As winner of the contest's "On the Track" category, Brown will receive a $50,000 (USD) Champion racing sponsorship. Fetter, winner of the "Off the Track" category, will receive a $5,000 (USD) prize. Federal-Mogul Motorparts awarded a total of $137,500 in sponsorships to this year's grand-prize winners, runners-up and finalists. The annual Search for a Champion contest, established in 2012, encourages grassroots racers and consumers to demonstrate their commitment to superior vehicle and engine performance through the use of high-quality components. This year's contest attracted 1,110 participants, representing a nearly 400-percent increase over 2016. 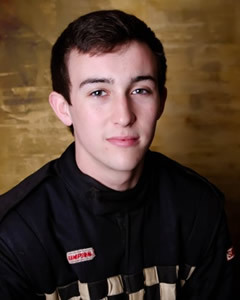 "This is unbelievable – I couldn't be more proud," said Brown, a high-school junior who garnered eight wins and 12 top-three finishes in 17 starts at Richmond (Ky.) Raceway in 2016. "I hope to use the prize money to travel to more tracks outside our region and become a better driver while promoting the Champion brand." In addition to Brown's $50,000 grand prize, Federal-Mogul Motorparts will award $5,000 (USD) to each of 10 runners-up and $1,000 (USD) to each of 25 finalists in the "On the Track" category. 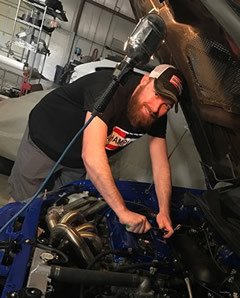 Fetter, a technician at F & S Collision and Customs, a family-owned business in Troy, entered the "Off the Track" category based on his interest in vehicle maintenance and performance upgrades. "I've known about Champion all my life, and my grandfather even had a Champion sign in his garage when I was growing up," he said. "I am looking forward to representing the brand and using even more of its maintenance products in our shop and on my own vehicles." Joining Fetter as prize winners in the "Off the Track" category are 10 runners-up who will receive $500 (USD) each and 25 finalists who were awarded $100 each. "Search for a Champion has been a success from day one, but its record growth over the past year mirrors the broader success we have had in connecting with multiple generations of racers and consumers who are passionate about the products they choose for their passenger vehicles, four-wheelers, boats, tractors and other engine-driven equipment," said Mike Proud, vice president, marketing, Americas, Federal-Mogul Motorparts. "Champion above all is a brand they know and trust." The Champion brand offers a growing range of products, including easy-to-install bridge-style, beam, hybrid, winter and rear wiper blades; oil, air and cabin air filters; batteries for automotive, commercial, marine, golf cart and lawn-and-garden uses; replacement premium capsules, HID and sealed beam headlights and LED and incandescent light bulbs; and world-class replacement spark plugs for automotive, motorsports, small-engine and other applications. To learn more about Champion and the Search for a Champion contest, please visit www.championautoparts.com. Follow the brand on Facebook at www.facebook.com/ChampionSparkPlugs, Twitter (@ChampionPlugs), and Instagram (www.instagram.com/ChampionPlugs). Federal-Mogul LLC is a leading global supplier of products and services to the world's manufacturers and servicers of vehicles and equipment in the automotive, light, medium and heavy-duty commercial, marine, rail, aerospace, power generation and industrial markets. The company's products and services enable improved fuel economy, reduced emissions and enhanced vehicle safety. Federal-Mogul Motorparts sells and distributes a broad portfolio of products through more than 20 of the world's most recognized brands in the global vehicle aftermarket, while also serving original equipment vehicle manufacturers with products including braking, wipers and a range of chassis components. The company's aftermarket brands include ANCO® wipers; BERU®* ignition systems; Champion® lighting, spark plugs, wipers and filters; Interfil® filters; AE®, Fel-Pro®, FP Diesel®, Goetze®, Glyco®, Nüral®, Payen® and Sealed Power® engine products; MOOG® chassis components; and Ferodo®, Jurid® and Wagner® brake products and lighting. Federal-Mogul was founded in Detroit in 1899 and maintains its worldwide headquarters in Southfield, Michigan. The company employs nearly 53,000 in 24 countries. For more information, please visit www.FMMotorparts.com.